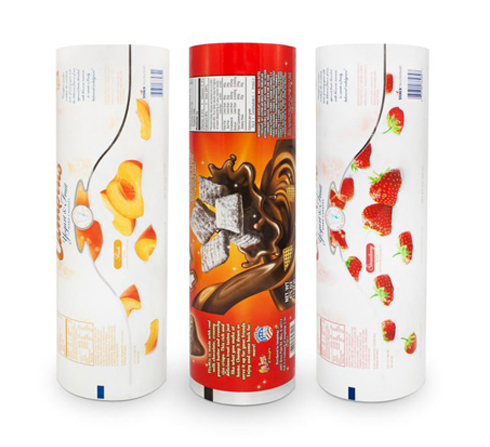 All of our roll stock materials provide superior protection and enhancement of your brand. Our standard offerings include a wide range of materials, laminations, sizes, gauges, print and slit configurations for your short run or high-volume form-fill and seal applications. Jet’s team of packaging experts offers laser-scored roll stock that runs at optimal efficiency on your own machines with high-speed production run capabilities with minimal scrap for both your VFFS and HFFS machines. We can even provide custom material applications for machines with atypical coefficient of friction (COF) and heat seal initiation temperature (HIST) needs. Whatever the ultimate solution, Jet will work with your machines to speed production and minimize waste. Our standard and custom rollstock solutions are available for short runs with no minimum order, or standard production runs. Contact us today to discuss your project.